You can learn how to make a banana muffin recipe. There are not many people who do not love this recipe or anything else made with bananas. It is one of the most popular fruits all over the world. Although there are many different species in different parts of the world, all are very tasty. This fruit has a soft flesh covered with a thick rind and is very rich in starch and high in sugar. 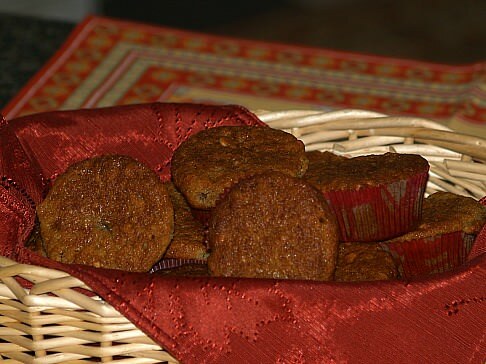 If you are learning how to make a banana muffin recipe, it is best to have very ripe bananas. These are sweeter, the flavor is stronger and they make the muffins moister. When I purchase bananas, I let a few of them get very ripe. I then peel the rind off. After putting them in freezer bags, I place in my freezer. When I decide to learn how to make a banana muffin recipe, I remove the bananas from the freezer and let them thaw. If I need them thawed quickly, I place them in the microwave for a few second; it doesn’t take long. These are perfect for baking. If you want to make a banana muffin recipe and you have green bananas, you can help them to ripen more quickly. Place them in an open paper bag and place it on the kitchen counter. Make sure it is away from the direct sunlight and heat. Lightly grease or use paper liners a 2 ½ inch muffin pan. Combine the flour, baking powder and baking soda in a small bowl. In a large mixing bowl beat the whipping cream, butter, peanut butter, and sugar until smooth. Add the bananas, maple syrup, egg and vanilla; beat to blend. Add the flour mixture to the creamed mixture and stir just to moisten. Fill muffin cups 2/3 full and sprinkle each with the peanuts. Bake for 25 minutes or until pick comes out clean. Makes 18 to 20 regular size muffins. These banana muffins takes on the added flavor of oats and butterscotch chips. How delicious! Use paper liners or grease 2 ½ inch muffin pans. Puree banana in the blender; should have 2/3 cup. In a medium bowl combine the banana, egg, milk, sugar, oil and vanilla. In a large bowl combine flour, oats, baking powder, baking soda and salt; stir in the butterscotch chips. Stir the banana mixture into the dry mixture until just blended. Spoon batter evenly into muffin pan and bake for about 15 minutes or until pick comes out clean. ¼ Cup jelly, marmalade or preserves. Use paper liners or grease a muffin pan. Combine the flour, sugar, baking powder, salt and soda in a large bowl. Make a well in the center and add the egg, oil and banana; stir just to moisten. Spoon batter into muffin pan 1/3 full each. Spoon 1 teaspoon of the jelly, marmalade or preserves in the center of each cup. Spoon remaining batter into the cups making each 2/3 full. Bake for 18 to 20 minutes or until light brown and set. Preheat oven to 400F degrees; line (18) 2 ½ inch muffin cups with paper liners. Combine ¾ cup walnuts with ½ cup sugar; set aside. In a large bowl beat ½ cup walnuts, 1 cup of sugar and butter until light and fluffy; set aside. In blender puree 2 ripe bananas; beat banana and egg into sugar mixture. In medium bowl combine flour, baking powder, cinnamon, nutmeg and salt; beat into banana mixture. Mash small banana in a small bowl; stir in raspberry jam. For each muffin roll a heaping tablespoon of dough into walnut sugar mixture; place in muffin cup. Make a “dimple” in center of dough with the back of a spoon; spoon 1 teaspoon jam in “dimple”. Roll another heaping tablespoon of dough into walnut sugar mixture; drop on top of jam mixture. Repeat process with remaining dough and jam; bake for 15 to 20 minutes until pick comes out clean. Cool 5 minutes in pan; remove from pan to cooling rack. Makes 18. Preheat oven to 400F degrees; line (12) 2 ½ inch muffin cups with paper liners. Combine in large bowl flour, sugar, baking powder, lemon peel and salt; set aside. In a small bowl combine papaya, banana chips, nuts and coconut. Stir 1 tablespoon of the flour mixture into the fruit and nut mixture until well coated. In another bowl combine milk, butter, sour cream and egg until blended. Stir milk mixture into flour mixture just to moisten; fold in the fruit mixture. Spoon into prepared muffin cups dividing evenly; sprinkle with 1 tablespoon of the sugar. Bake about 20 minutes or until pick comes out clean; cool on wire rack.